This page provides visa information for UK Citizens wanting to travel to Bosnia and Herzegovina. 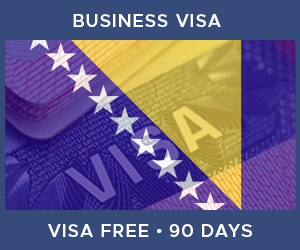 Visa Status: Visa Free Travel Citizens of the United Kingdom do not require a visa to travel to Bosnia and Herzegovina as long as their stay is shorter than the maximum stay. British Nationals do not require a visa for Bosnia and Herzegovina for a period of up to 90 days within a period of 6 months. If you wish to stay for longer than 90 days, you must apply to the Border Police for a Residency Permit. You will be required to show evidence that you have no criminal record in the UK. You will have to obtain this before you travel. Ensure that your passport is stamped when you enter the country, as the Border Police may fine you when you leave if you do not have one. Your passport must be valid for a minimum of 90 days from the date of your departure. All foreign nationals must register with the police within 72 hours of arrival. Usually, hotels and registered hostels will arrange this for their guests. Children under the age of 18 years old travelling unaccompanied or accompanies by an adult other than their parents must carry a notarised letter from their parents giving permission for the child to travel. If the child is travelling with one parents, the accompanying parent should carry a notarised letter from the other parent giving permission to travel. Citizens of the United Kingdom can enter Bosnia and Herzegovina without a visa for up to 90 days. The information found here is based on the response provided by the Bosnian embassy. We recommend you always double check the latest information directly with the embassy before you travel. If you wish to travel for longer than the visa-free period, you should speak to the Bosnian embassy directly on 0207 373 0867. In order to travel to Bosnia and Herzegovina there are a few requirements. Click on any of the icons below to learn more about each one. Single parents or adults travelling with children under the age of 18 are required to provide notarised documentary evidence of parental responsibility, or consent to travel from those with parental responsibility. Such documentation is often required before being allowed to enter the country and, in some cases, before permitting children to leave the country. Children under 18 years of age who are travelling unaccompanied, or accompanied by an adult person other than their parents, must carry a notarised letter from their parents giving permission for them to travel. The name of the accompanying adult must be clearly stated. If the child is accompanied by one parent, particularly if the parent has a different surname to the child’s, the accompanying parent should carry a notarised letter from the other parent giving permission to travel.